Monbulk shot out to a 20-point lead at quarter time and Belgrave was always chasing from there. Belgrave won the last quarter, kicking seven goals to two, but it was all too late. Monbulk best: J. Major (6 goals), M. Dekker (1 goal), D. Banks (1 goal), L. Beecroft, M. Langworthy, A. Smith. Belgrave best: P. Johnson (5 goals), C. Power (1 goal), J. Brown (1 goal), D. Bilston, L. Sproules. Olinda Ferny Creek will play in a qualifying final next week. Olinda started with six goals to one in the first and really coasted from there. They had a 50-point lead at half time and held Warburton to three goals in the second half while kicking 13. Olinda Ferny Creek best: D. Troutman, K. Currie, S. Atkinson, M. Hottes (2 goals), D. Wilson, L. Taylor (6 goals). Warburton Millgrove best: L. Weir, J. Walker, L. Barnard (1 goal), C. Reiffel, T. McKail (1 goal). The first quarter was tight with only five points separating the sides. 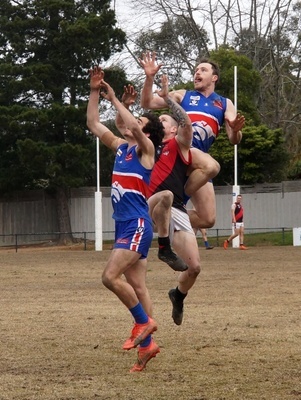 Woori extended its lead to 12 points at half time, and ran away with it in the second half, kicking six goals to three. Woori Yallock best: R. Monkhorst, S. Kennedy, M. Wright, M. Lowe (1 goal), L. Boontjes, J. Matthews (4 goals). Mount Evelyn best: C. Urquhart, M. Brierley, D. Watson, J. Wolstencroft, A. Condello, T. Hallett-Tauali’’i. Upwey Tecoma will play Healesville again next week in an elimination final. Healesville got the jump on Upwey in the first, kicking four goals to zip. Upwey came back in the second with a five-goal quarter to be down by 18 points at half time. The third quarter saw Upwey kick 6.6 to 2.2 to take the lead by 10 points as they headed for home. Healesville won the last but could not find the big sticks in the end. Upwey Tecoma best: K. Grenda (2 goals), D. Bell (4 goals), L. Beacom, B. Bantoft, J. Waters, B. Hinton. Healesville best: J. Nugent (1 goal), J. Roe-Duggan (2 goals), C. Warren, L. Daly, L. Barclay, N. Mende. Wandin finished third and will take on Olinda Ferny Creek in the qualifying final next week. Wandin kicked eight goals to two in the first. Emerald bit back in the second, kicking 3.5 to 1.3 to reduce the margin to 23 points at half time. Wandin got their skates on in the second half, kicking 11 goals to six. Wandin best: R. Heasley, H. Byrne (1 goal), P. Bruzzese (1 goal), J. Van Unen (9 goals), J. Del Giudice, T. Leech-Hines. Emerald best: H. Lang, J. Pedder (2 goals), L. Sheppard (1 goal), J. Rich, J. Marshall (1 goal), R. Goonan (1 goal). 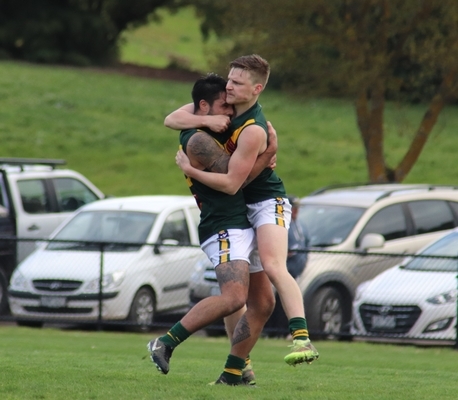 Yarra Junction stormed home to beat second-placed Yarra Glen to now take on minor premiers Seville in next week’s second semi-final. Yarra Glen will lick their wounds and prepare to take on Gembrook Cockatoo in the knockout first semi-final. Yarra Junction won a low-scoring first quarter by nine points. Yarra Glen kicked 4.1 to 3.1 to reduce the margin at half time to three points. The third quarter is where things went wrong for Yarra Glen. 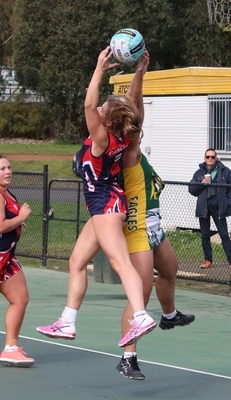 They could not manage a major but kicked eight behinds while Yarra Junction kicked 2.1 to increase their lead to eight points. There was no wind to speak of, but it seemed like the scoring end was the Pony Club end of the ground, so Yarra Glen was still in with a chance. Yarra Junction soon put pay to that idea, holding Yarra Glen to just one behind in the last while they kicked a very handy 6.4. Yarra Junction best: M. Sword, T. Armstrong, B. Clark, T. Wheeler (5 goals), C. Hoare, D. Brookes. Yarra Glen best: B. Ashton, A. Smith, R. D’Argent, T. Russell, J. Marks, G. Filsell. Gembrook will take on Yarra Glen next week in a cutthroat semi-final. Gembrook got the early lead by seven points at quarter time. They extended that to 19 points at half-time and looked in control. Both sides kicked 4.4 in the third. Gembrook peppered the goals in the last, kicking 2.8 to Alexandra’s 3.1 to come away with a not so convincing win. Gembrook Cockatoo best: D. Scott, M. Firrito (2 goals), D. Welsh, A. Mitchell, A. Shipp (4 goals), R. De Reus. Alexandra best: D. Rouget, W. Goonan, S. Steiner (1 goal), M. Coombs, B. Cooper (1 goal), C. Heaslip. Yarra Glen best: C. Moate, K. Braun, S. Twite-Moore (3 goals), L. Coulson, G. Ely, M. Wood. Yarra Junction best: T. Barton, M. Lockyer, C. Scott, C. Collins (1 goal), H. Chamberlain, A. Ward. Seville best: S. Saniga, C. Suban (2 goals), G. Teunissen, K. Mountjoy, A. Knight, N. Sciortino. Yea best: B. Broadway (1 goal), E. Neilson, D. Pell (1 goal), T. McMahon (2 goals), J. Mahon (1 goal), I. Porter. Monbulk best: K. Linde (2 goals), M. Dekker (1 goal), S. Smith, W. Fahey, A. Richardson, D. Rak (1 goal). Gembrook Cockatoo best: J. Burchill, L. Ramage (8 goals), M. Watson, B. Diprose, A. Firrito. Warburton Millgrove best: E. Leeds, J. Coshutt (1 goal), T. Walker, A. Nelson, R. Nyko, J. Farrugia (1 goal). Mount Evelyn best: J. Hattwell, M. Darke (1 goal), N. Hoskin, H. Watson, C. Burton (5 goals), B. Westaway. Woori Yallock best: T. Amarant, C. Cameron (1 goal), R. Foy, J. Hay, C. Cotton, L. O’Dea. Healesville best: J. Simnett, C. Wright, J. Rosser, J. Lawry, K. Brown, W. McVay. Upwey Tecoma best: T. Johnson, J. Sheehan, J. Pandelias, P. Booth (1 goal), B. Burrows, C. Jones. Wandin best: A. Mandl (3 goals), J. Goodburn (2 goals), A. Baker (2 goals), R. Johns (1 goal), D. Wathen (1 goal), M. Feakes (1 goal). Emerald best: J. Raukola, B. Walker, B. Lewis (1 goal), J. Latham, A. Kapahnke, H. Stratford. Wandin will take on Belgrave in a qualifying final. The side dominated from the outset. Wandin best: C. Seivers, J. Cullimore (56 goals), K. Dolphin. Emerald best: K. Ellis (3 goals), H. Scott, S. Bertram. Upwey shot an impressive 21 goals to five in the first and another 17 goals in the second to lead by 31 goals at half time. They continued that dominance in the second half. Upwey Tecoma best: G. Bull (21 goals), B. Price, S. Silvester (53 goals). Healesville best: A. Stanley (7 goals), A. Bryan (4 goals), C. Chandler. Mount Evelyn will not play in finals but gave fourth-placed Woori a shake-up. Woori had a one-goal lead at quarter time and it was all square at half time. Mount Evelyn got the play in the third and led by two goals at the last change. Woori Yallock played the last quarter like their life depended on it. Mount Evelyn best: M. Livesey, J. Black, S. Jones. Woori Yallock best: S. Bailey (7 goals), A. Newham, S. McCabe. Belgrave will take on Wandin in a qualifying final next week while Monbulk will take on Woori Yallock in an elimination final. The first quarter was an even battle, with Belgrave holding sway by four goals. They extended that lead to 12 goals at half time and shot 20 goals to 14 in the third. Monbulk outplayed them in the last, shooting 15 goals to 9, but could not claw back the lead. Belgrave best: L. Bennett (44 goals), J. Brady, A. Jeffery. Monbulk Hawks best: K. Seamer, N. MacDowell, B. Williams (45 goals). Olinda Ferny Creek finished minor premiers and will have next week off, and Warburton Millgrove just missed out on playing finals by percentage. The score did not indicate that it was all Olinda’s way, but they got home by 24 goals at the final siren. Kinglake best: M. Nagle (20 goals), C. Ryan, A. Barnes. Seville best: S. McNay, A. Tucker, P. Stanley (22 goals). Powelltown best: J. Darwall, O. Caneva (19 goals), G. Haynes. Yarra Junction best: A. Finn (21 goals), C. Lever, A. Ula. Yea best: M. Sundblom (51 goals), C. Hayes (16 goals), S. Watts. Powelltown best: M. Haynes, K. Peers, S. Meades (6 goals). Yarra Glen best: K. Vanderkolk, S. Corrigan, M. Bock (17 goals). Yarra Junction best: C. Neale, M. Baptist, I. Bosen (13 goals). Seville best: R. Groen (38 goals), E. Corbett, N. Quilty. Alexandra best: B. Pearce (26 goals), M. Gesler (23 goals), M. Richards. Powelltown best: S. Traynor (18 goals), L. Stirland, G. Crofts. Gembrook Cockatoo best: M. Crawford (1 goal), D. Millership (11 goals), M. Uren. Yea best: T. Britton, E. Edge, H. Broderick (22 goals). Alexandra best: C. Read, C. Callander, K. Webber-Lally. Yarra Glen best: M. Young, C. Adam, K. James. Powelltown best: C. Hermansen, H. McIntosh-Forrer, S. Long.